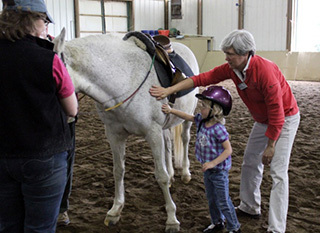 Climbing on a horse for the first time for anyone is a challenge – but for sight-impaired students from the Cleveland Sight Center it takes an enormous amount of trust. Conquering this challenge helps build confidence. It also helps these students gain balance and strength, which is important as balance issues and low muscle tone are common for those with sight impairments. Sitting on a horse naturally challenges one’s balance. Riding also builds strength and improves posture. Leg muscles stretch and strengthen and core muscles work to hold the body balanced and strong. The Sight Center has been coming to Fieldstone Farm for many years thanks to our donors. The spring session was funded through a generous donation from ESCO Technologies.